As a kid I can remember my grandmother telling me to go down to her basement to grab a jar of tomatoes she had canned the previous summer. I knew that meant she was making her famous ribs, so I was pretty excited, but I also was afraid to go down to the basement by myself. They lived in an old house my grandfather built himself with creaking stairs and you had to make your way down part way in the dark because the hall light wouldn’t reach the whole way. I would hold my breath down the last few stairs, heart beating out of my chest, as I felt around the corner for the light and then breath a sigh of relief when I found it. I would then run to grab the tomatoes and run the hell back out of there. I still think basements are creepy. 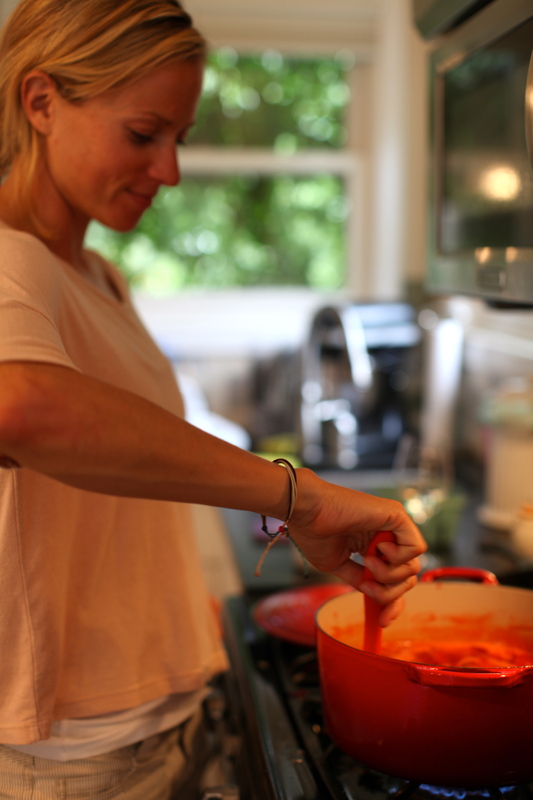 I loved the sauce she would make with those tomatoes, so it was worth it. I always wanted her to teach me how to can and she’d always shrug it off saying it was so easy. What was there to teach? I think my grandparents generation took for granted how challenged we are with things like that today. Convenience has made us fairly inept at things that were simple to them. Today I made my first attempt, although I have no idea if I did it the way she did. 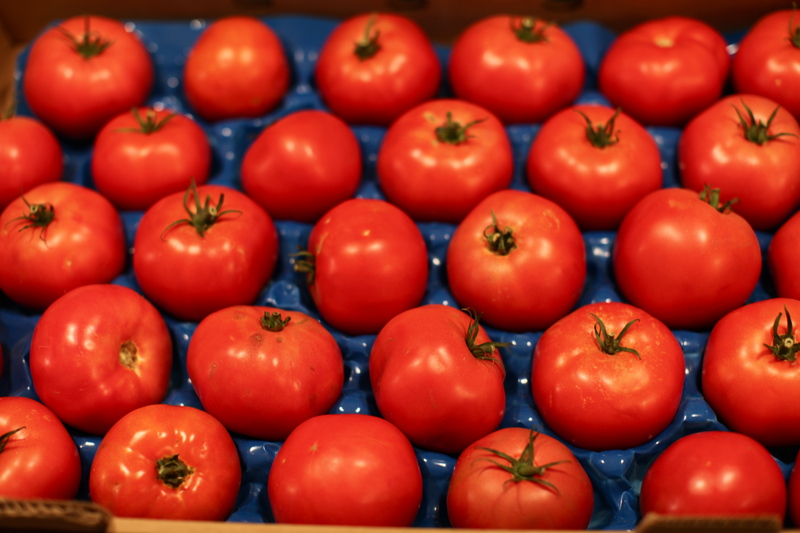 I bought a flat of tomatoes at the Munson Farm stand for $35 which had just been picked an hour before. I told myself this justified the fact it was actually more expensive to can than it would have been to just buy canned tomatoes. My friend Alicia came over and helped me out. 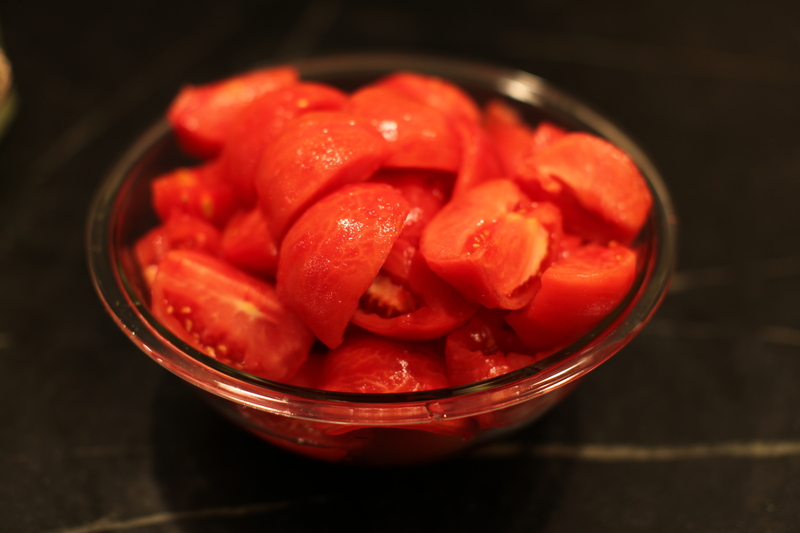 First I blanched the tomatoes for 60 seconds in boiling water and then put them in an ice bath. The skins came right off and then we cored and quartered the tomatoes. I also juiced fresh lemon juice to add to the jars. First we sterilized the jars and lids in the dishwasher and kept them there until we were ready to use them. 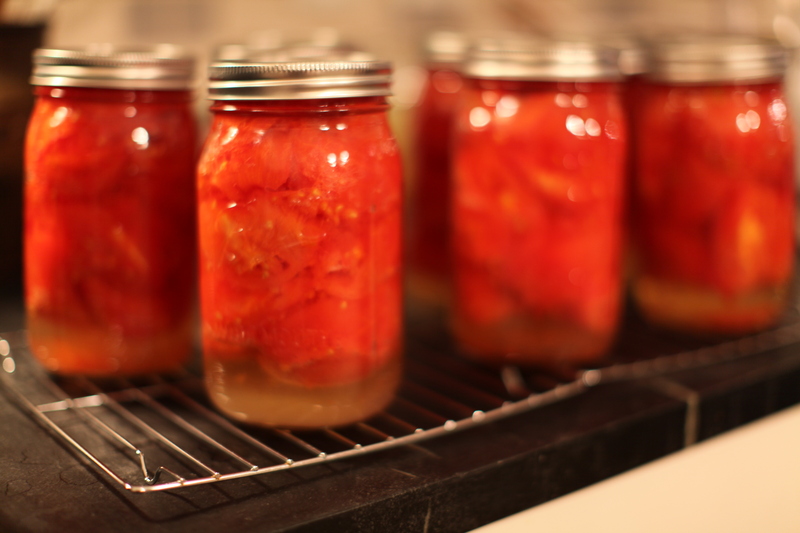 We packed the tomatoes into the quart jars up to 1/2″. One flat yielded 7 quarts. We added 2 T. fresh lemon juice and 1 t. salt to each quart jar and poured some of the juice that had run off into the bowls over them. We filled the rest up to 1/2″ with the water from the blanching. Using a butter knife we got rid of any trapped bubbles and then added the lids. I processed them in a boiling water bath for 55 minutes. We had to add extra time for the altitude. 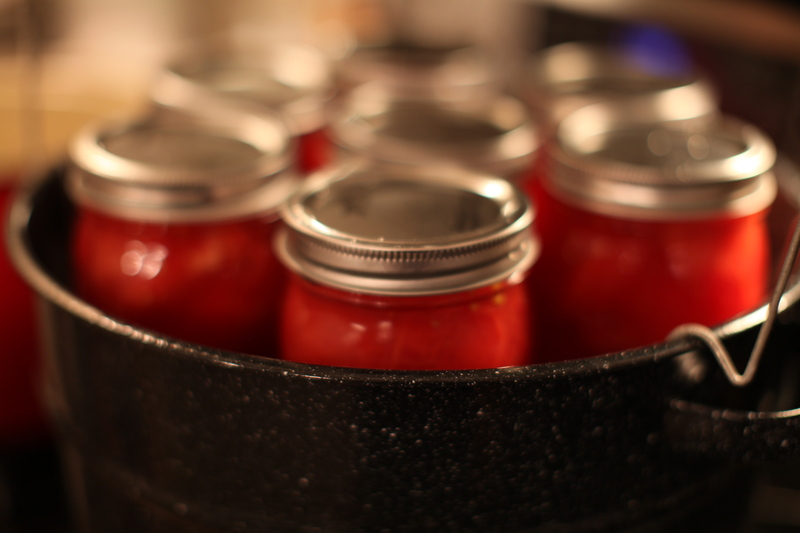 I have become much more comfortable with canning after this week and trusting that the jars are going to seal. My grandma would be proud of my first batch of tomatoes. These will be going in my kitchen pantry though so I can avoid any creepy basement encounters! Another summer favorite of mine other than peaches is basil. As I was looking into making preserves, my sister suggested adding some to the peach preserves I was making. It’s pretty amazing. It’s two perfect summer flavors that actually go pretty well together. 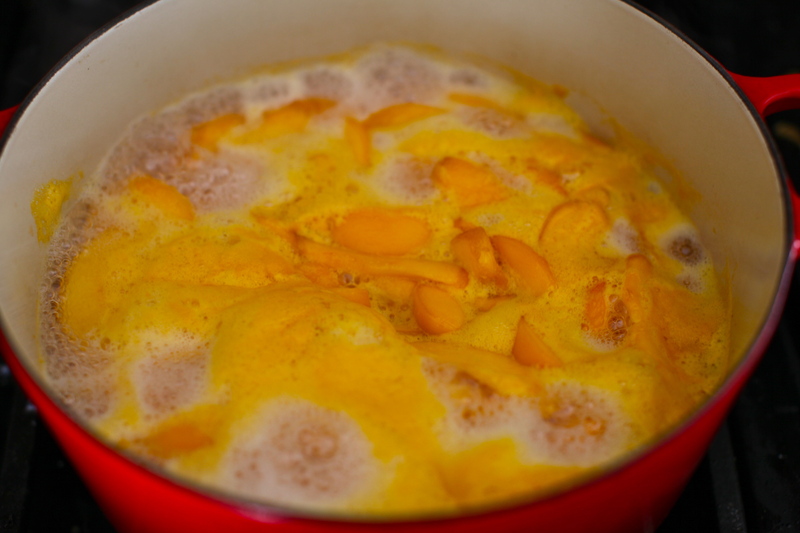 First you blanch the peaches by placing the in boiling water for 30-60 seconds followed by an ice bath. Once they cool, the skins come right off and then you cut them into 1/3″ wedges. 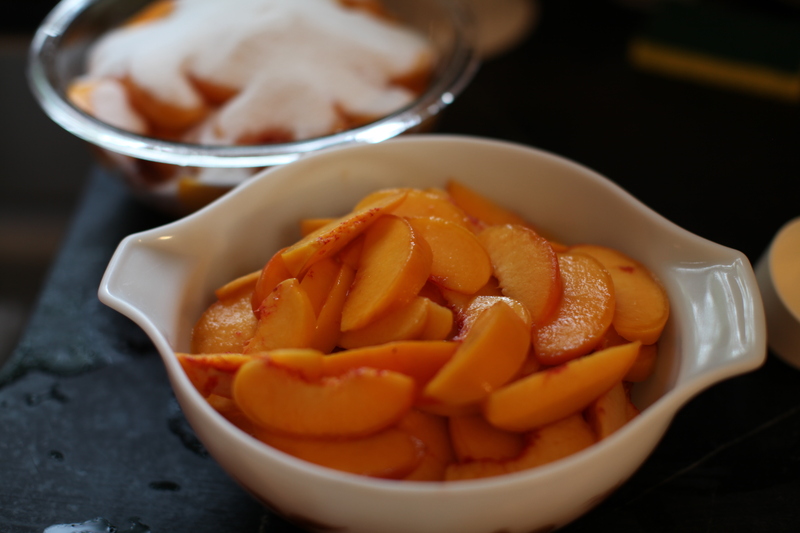 I processed 6 1/2 lbs of peaches. 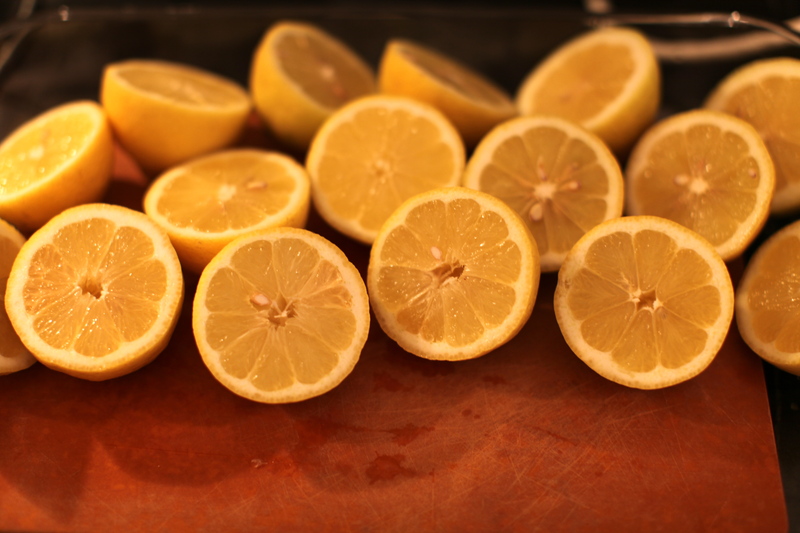 Then you add 3 cups of sugar and 3 1/2 ounces of fresh lemon juice. Mix gently in the bowl and then cover with saran wrap. I separated it out into two mixing bowls, one for plain peach preserves and the other for basil peach preserves. Make sure the saran wrap is flush against the peaches to minimize exposure to air. Put in fridge overnight. The next day bring to a boil for 5 minutes. Remove from heat and skim foam off the top. Using a potato masher, mash the peaches to break up the wedges a bit. It will further breakdown so you can do it later on to your taste. I like to still have chunks of fruit in my preserves. Bring back to a boil for 25-40 minutes until it thickens. 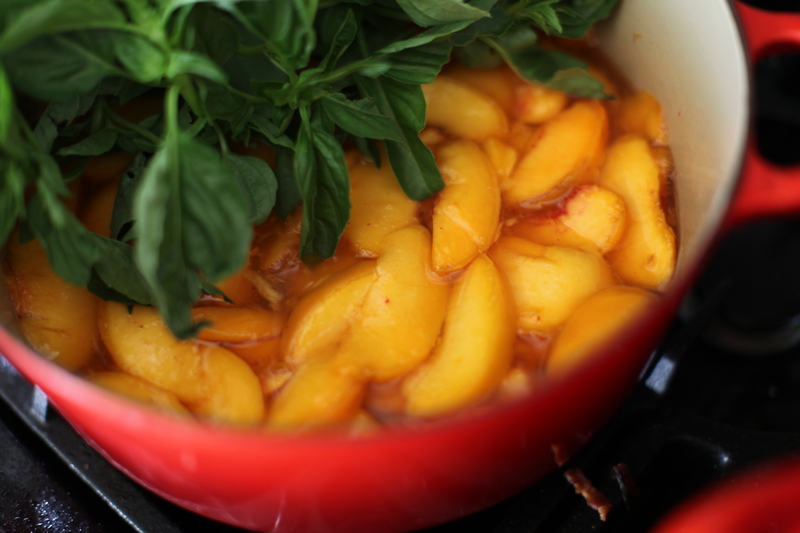 For the basil peach preserves, add a bunch of fresh basil in as it is boiling. You can remove it before jarring. The way to test if it is right is to put a few spoons in the freezer, pull one out and put a little jam on it. Put it back in the freezer for 3 minutes. When you hold it up if it is runny it still needs more time boiling. Sterilize the jars by running them through the dishwasher and then process the filled jars in a water bath for 15 minutes. I used 4 oz. jars and am at high altitude. Timing depends on what kind of fruit you’re canning, the jar size and altitude. I’m looking forward to a croissant with brie and peach preserves tomorrow! Peaches have to be the epitome of summer. I grew up in S.C. and peaches were one of those things you look forward to seeing spring up in all the roadside fruit stands. A little known fact is that even though Georgia claims itself as the peach state, S.C. produces twice as many peaches. Georgians like to say it’s quality not quantity but it sounds like some sore losing talking to me. Moving to Colorado I thought I would have to give up delicious produce. Last summer I was pleasantly surprised when I noticed one of the trees in our backyard was actually a peach tree. What I was able to salvage from the deer turned into delicious peach cobbler and peach bellinis. This year sadly it decided to take a break. 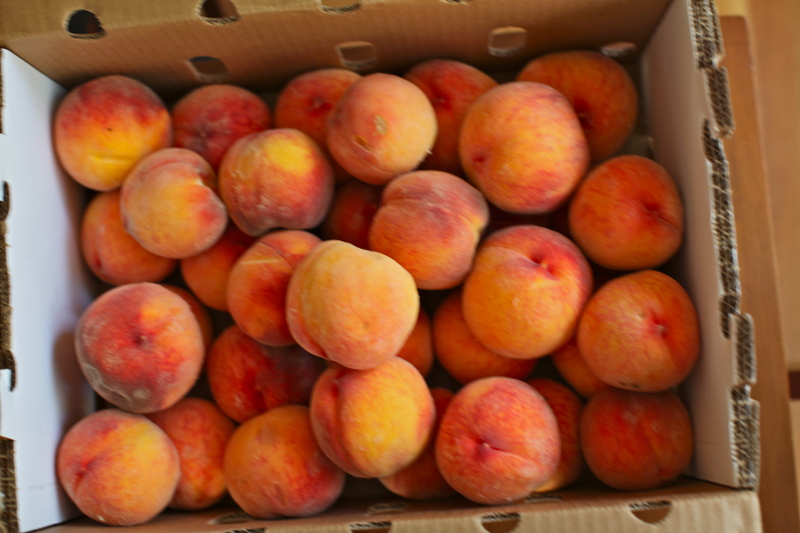 I did track down the amazing peaches above from the Munson Farms fruit stand to make up for it. 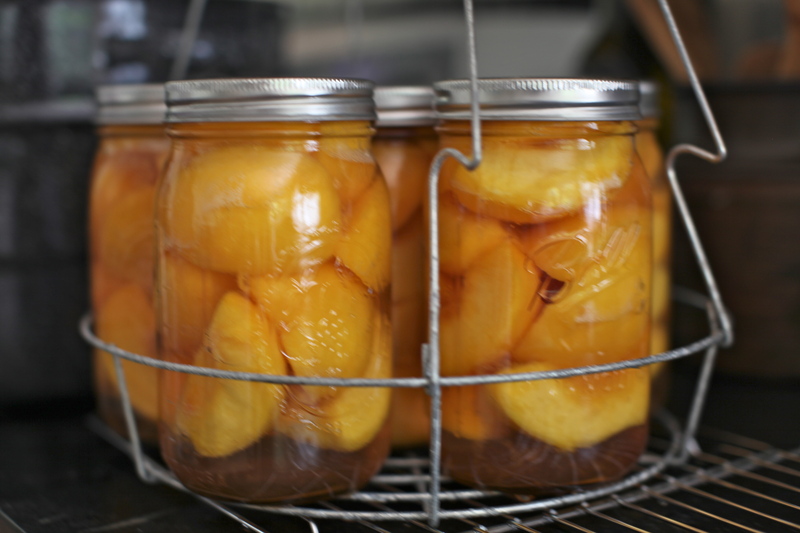 Canning peaches is surprisingly easy, even at higher altitude. You start by blanching them to peel off the skins. 1 minute in boiling water followed by immersing them in an ice bath and the skins come right off. I then quartered them. They are pretty slippery, so be careful. As I was peeling and quartering them I brought a simple syrup to boil. It’s one part sugar to four parts water. This is a lighter syrup since I didn’t want to go sugar crazy. 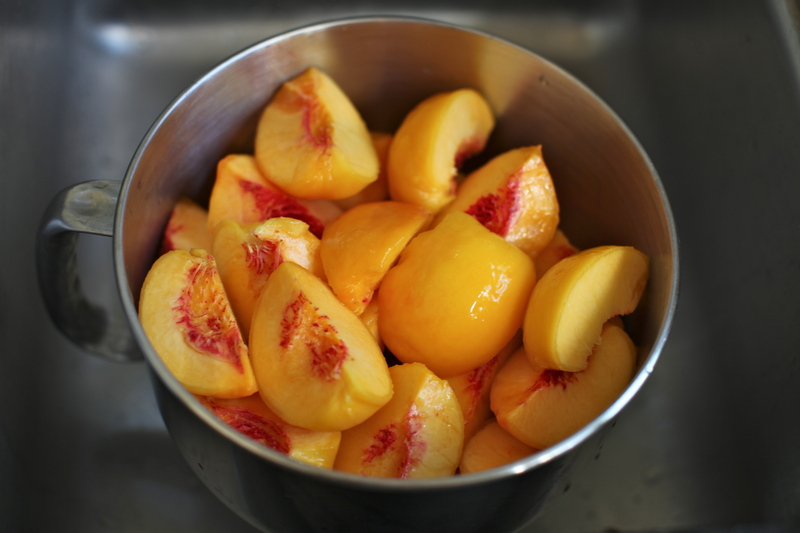 I ended up using 8 cups of water/ 2 cups of sugar for 6 quarts of peaches. Next it was time to pack the jars and pour the simple syrup over them. 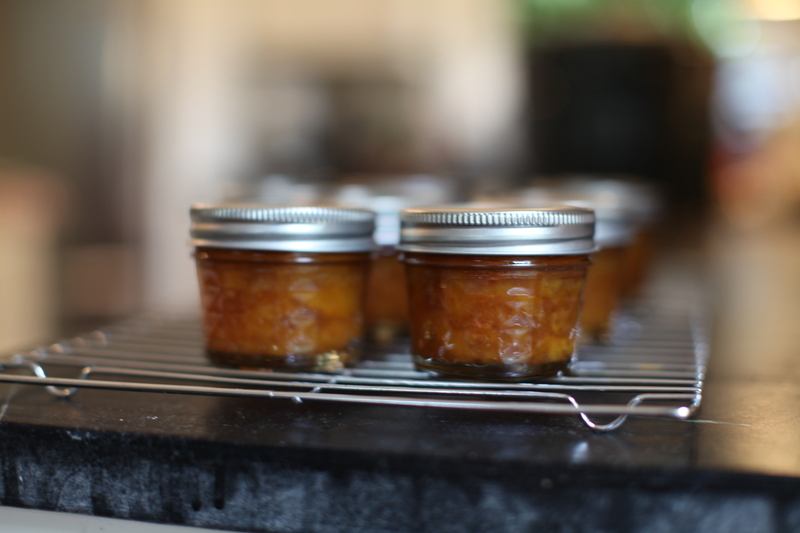 I used quart jars and sterilized them before using in the dishwasher along with the lids. I immersed them in a boiling water bath and let them boil on medium for 35 minutes. I am at 5,000 ft altitude, so we have longer boiling times. I packed them to 1/2 of an inch with the syrup in the jar. Then I took a butter knife to make sure all the air bubbles were out by running it along the inside of the jar. After the bath, I set them out to cool and heard the satisfactory pop to let me know they were sealed. That has to be one of the best sounds. You know you did it right. The pantry is starting to fill up with the reds and golds of summer! I had forgotten what strawberries should taste like until yesterday. It’s been so long since I’ve had a strawberry picked straight off the farm. Yesterday I went to Berry Patch Farms just outside of Denver. It’s a self-pick farm that not only had berries yesterday but also gorgeous flowers and pickling cucumbers you could pick. They also have amazing produce for sale inside the adorable barn. It’s a fun thing to do with kids and yesterday I was joined by my friend Kelly and her berry picking master of a son, Darwin. At only age 2, he was a real trooper since even at 10 a.m. it was already in the 80s out there picking in the fields. I will go to great lengths for fresh picked strawberry preserves. It may not be as fancy as a lot of the artisanal stuff out there, but it has to be one of my favorites for its simplicity. 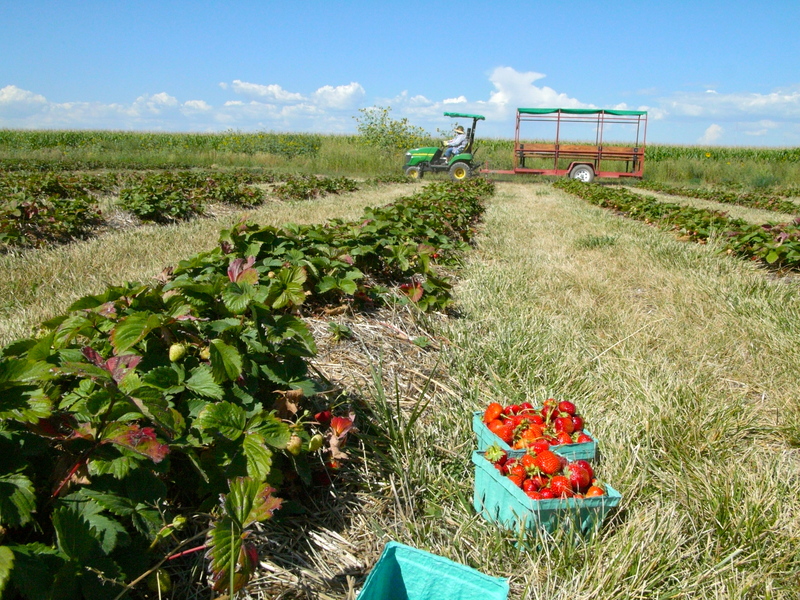 It’s just hard to beat, especially when you have strawberries as delicious as the ones we picked yesterday. I used a simple recipe out of The Blue Chair Jam Cookbook for “Children’s Strawberry Jam”. This recipe was similar to others I found online. It was very easy to make only requiring 3 ingredients: delicious strawberries, sugar (I forgot how much goes into this stuff!) and fresh squeezed lemon juice. I halved this recipe since the pickings were a bit slim at this point at the farm. I couldn’t have done 2 hours out there. It smells pretty amazing as it starts to cook & thicken. It’s one of those things when people hear you’re making preserves it’s easy to conjure up helpers. 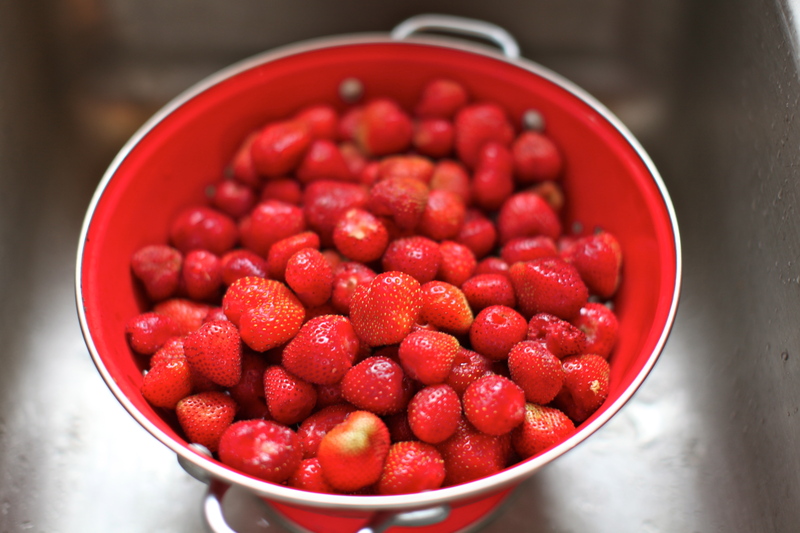 My friend Mary came over later and helped me out cleaning strawberries and stirring the jam. It’s always more fun to do this kind of thing with friends. I enjoyed my first taste this morning on a flaky, warm croissant. Amazing! Summer seems to be the season we all want to prolong the most. When I used to live in Boston you would never hear me saying I wished winter would last longer. We’re still in the midst of summer, but the signs are there we’re heading into its last days. School is back in session. Days are getting a little shorter and nights a little crisper. The gardens & trees are slightly less lush & green than they were just a few weeks ago. The seasons still march on whether we like it or not, but there is one way to keep a bit of summer throughout the rest of the year. Preserving. We can capture its vivid colors and flavors and simply suspend them in a jar. Whenever the days seem just a little too cold, dull and barren we can resort to the little bit of summer we’ve stashed away in the pantry. 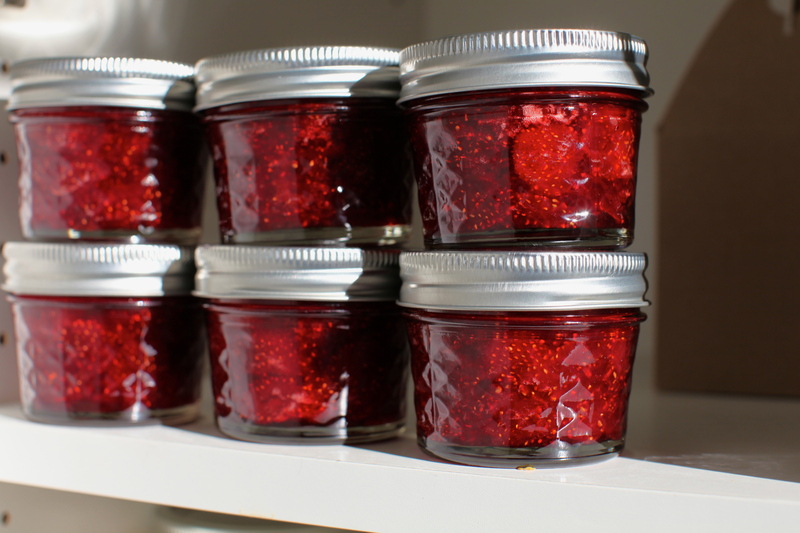 Bright strawberry preserves spread on a warm slice of toast will set us right again. We can pull out a sun-kissed golden can of peaches to nibble on. Preserving came about out of necessity but I think it was equally born from a desire to hold onto the things we love a little bit longer. I look forward to having a bit of summer stowed away in our pantry after this week. It will make it seem a little easier to say goodbye to my favorite season until next year. You are currently browsing the 34 preserving category at 52 To Do.